I remember the first time I went to watch this movie. A friend and I were in the mood to go the cinema but we were too late for all the movies we had first in mind. So we ended up watching this movie because it had a later showing and, was in truth, our only option. Now watching movies isn’t this dramatic affair of ‘now or never’ but I think I would have missed out on this movie if I hadn’t seen it that day. Luckily, my friend and I were late for everything else because watching this movie was one of the best cinematic experiences I’ve ever had in my life. Okay, basic plot: Duncan (Liam James) is an awkward teen who’s forced to spend the summer at a beach house with his mother, her boyfriend – Trent – and Trent’s superficial daughter, Steph. Duncan is extremely unhappy with the situation as he wanted to spend the summer with his father and Trent’s constant badgering of him doesn’t make the situation any easier to deal with. Duncan wanders around town seeking a reprieve from Trent and his new living situation and discovers a water park where he meets Owen (Sam Rockwell) – a renegade, free-spirited employee of the park. Owen takes Duncan under his wing, offers him a job and acts as a father figure that shows Duncan that there’s nothing wrong with being who he is and that Trent isn’t right about everything or anything, in fact. I love indie comedy-dramas like this. Movies like Little Miss Sunshine, This Is Where I Leave You; movies that are created not to break box office records but rather to share human stories. I love these stories because they’re character-driven and showcase real-life situations that you can relate to. 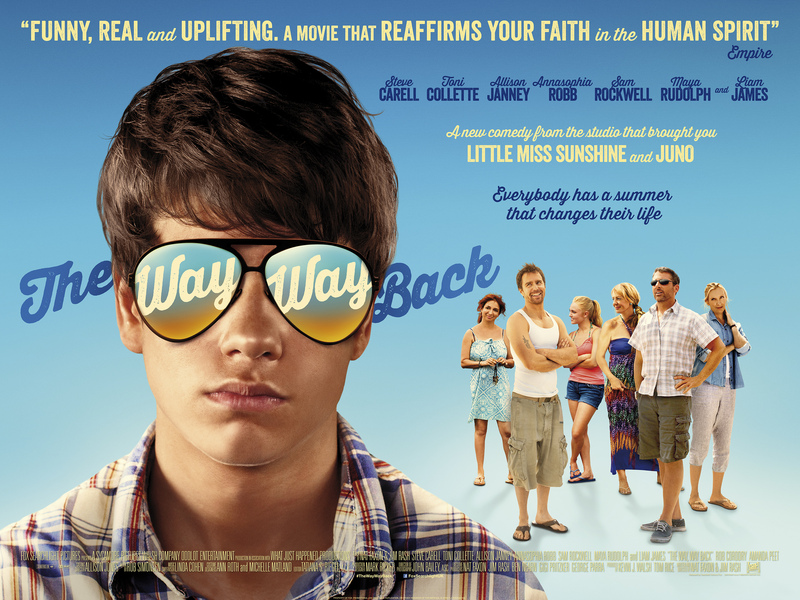 The Way Way Back, at its core, is a coming-of-age story about a teen struggling to find comfort in their own skin and their place in the world. I don’t know about you; but I wasn’t the most confident teen and I’m not the most confident person right now, so this is definitely a story I can relate to. I also loved the progression in Duncan’s character because it isn’t the typical zero to hero story arc. This isn’t a story about change, it’s a story about acceptance; accepting who you are and not compromising on that because you’re afraid that people won’t like that. The characters in this movie are incredibly genuine and completely free of pretense. I love how everyone in the film is flawed. No one is perfect, no one has it all figured out and this just further emphasizes the film’s message which is that life isn’t always about reaching perfection but rather attaining satisfaction with your flaws and who you are. The acting in this film is – as you’d expect in a film like this – top class! Liam James is wonderfully awkward and lovable as Duncan. Sam Rockwell, as per usual, knocks it out of the park. Rockwell brings this amazing charm and sense of humour to his character that’s extremely entertaining to watch. Steve Carrell, who stars as Trent, does great work and it’s interesting seeing Carrell play the ‘villain’ in a movie. Carrell still has a likeable appeal to his character but he’s perfect as this movie’s antagonist. Allison Janney also really impressed me as Betty, the gregarious (and somewhat alcoholic) neighbour of the family. I’d always thought of Janney as a very serious actress who only did dramatic work; probably because of her time starring in The West Wing but I’ve seen her take on quite a few comedic roles and she’s doing really well with them. There’s just too many good performances to single out in this movie, the entire cast is superb. Of course I cannot praise this movie without saying a word about writing and directing pair, Jim Rash and Nat Faxon. I’m familiar with the pair from various supporting roles they’ve had in movies and tv series, most notably Rash as the Dean in Community. I have to say I’m really impressed with the high-quality script the pair produced. It’s warm, extremely funny and full of real heart and soul. The dialogue is also incredibly sharp and full of wit. This really shouldn’t be a surprise, considering that the pair were fresh from on Oscar win for their screenplay for The Descendants.